A: We've got McCain and we've got a few others. I don't expect much of a fight at all. Now health care is going to be difficult. That's a very complicated issue. We debated at great length immigration. People understand the issues very well. We have not debated health care, so that's going to take a lot more time to do. What's that? "We've got McCain.."??? That certainly implies that McCain has gone over to their camp, at least in the view of Harry Reid. But last I heard, McCain changed his immigration view somewhat from a pro-open-border view to one in which he believes the borders should be sealed first, and then those illegals remaining would be dealt with humanely. The latter view is one with which I have no problem. It has been my own contention (not certain of Kev's complete view on this issue) that the border should be sealed tightly for national security. But I do not subscribe to any draconian view saying that those already here should all be deported immediately. Some certainly should, of course. But those who have long established ties, who have been productive contributors to our society should, IMHO, be allowed some sort of fast track to citizenship. And while that might not seem fair to those who've waited in line for years, it is certianly not fair, in my humble opinion, to toss all illegals over the fence when they were, for many years, beckoned to come here by our businesses and politicians, both of whom made it all too easy and tempting while looking the other way. I have sympathy for those poor neighbors south of our borders looking for a better life for themselves and their families, but I also have plenty of loathing for irresponsible authorities who allowed our sovereignty to dissolve over these many years by inviting desperate people to trash our borders. The punishment should go to the politicians. If you harbor the same suspicions I have regarding the coming Amnesty Bill, that the fence will not be completed or that Democrats will simply allow anyone into the country who promises to vote Democrat, there are things you can do. 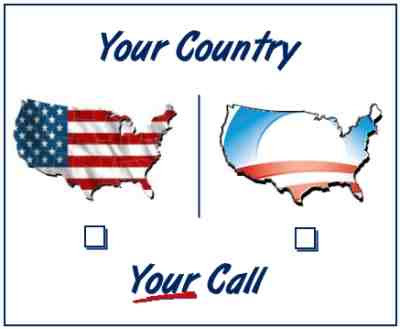 First, contact NumbersUSA by clicking HERE and registering with them. They are a one-stop-shop for keeping up to date on all border related issues, keeping track of all Congressional voting on immigration matters, and sending faxes and emails to your Congressmen (they will do both, you simply click on the letter you want faxed --- It's really easy!) I have sent faxes to mine, and I actually heard back from one of them. So I know that no one is faking the faxing. Second, send a fax! But register HERE first. Then a couple of clicks later your Congressman's (or woman's) ears will turn crimson while reading your objection to the proposed irresponsible immigration plan hatched by Democrats. It is, at the very least, a fun way to let off steam. Fourth, sign the petition to President-elect Obama asking him NOT to support general amnesty. Getting involved in issues like these gives one the feeling of empowerment that has eluded those of us on the Right lately... And even though they might pass Amnesty anyway with their huge Congressional majorities, why should we go whimpering into the night? If they fully intend to do it "easily" then let us at least make them sweat a little. Happy day after Thanksgiving, the kickoff for the month-long shop fest punctuated at the end with what most of us still regard as a blessed holiday. My kids' behavior during the TV commercials is, well, exactly what my own was at their age. That's what the TV guys want them to do. I want a whole lot of toys for Christmas! like they're showing in the ads! (Repeat a zillion times for the next month). Place your entries in the comments if you sign in with a Blogger account or URL traceable to a site with your email contact info. Otherwise, email me your entry at blogpoon(a)gmail(dot)com. Ties will be determined by timestamp. Update: I've altered a word in the first two lines to make it a closer match to the original. Is it a giveaway? This in from the Assyrian International News Agency, who at this writing have either scooped this story before American news outfits have gotten to it, or the Americans have wind of it but spiked it. One thousand Christians were today trapped inside the Coptic Orthodox Church of the Virgin Mary in West Ain Shams, Cairo, after more than twenty thousand Muslims attacked them with stones and butane gas cylinders. The Church's priest Father Antonious said that the situation is extremely dangerous. Meanwhile, in other news from India's financial capital of Mumbai, Muslim terrorists have waged holy war on infidel tourists, civilians, and railway commuters stationed at restaurants, hotels, two hospitals, a railway station, and a Jewish center. Brave Indian police paid the ultimate price in the rescue efforts that followed. Perhaps these stories bring something to mind immediately for which to be thankful today. Kevin and I have been very busy lately with our respective obligations outside of the bloggosphere, and have been unable to do any serious research or commentary. This will change when things settle down. In the meantime I'd like to go off-format for one post and relate a true turkey story from my preschool days in Sterling, IL. That would be 1968, for those of you keeping score. 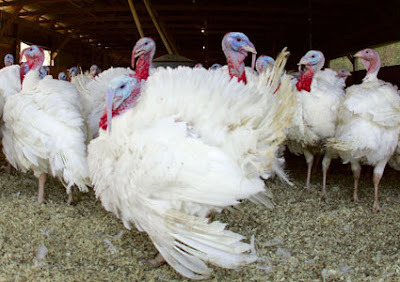 The thing that reminded me of it was the recent flap over Alaska Governor Sarah Palin pardoning a turkey while standing within view of a turkey processor in use. In the fall of 1968 when I attended secular nursery school (4 years old) at the local Presbyterian church building, one of the teachers, who happened to have her own 4 year old daughter enrolled, decided it would be fun and educational to take all 25 (or so) of us on a field trip to the nearby Gaulrapp Turkey Farm in Sterling, IL to see turkeys in all of their splendor. After all, since Thanksgiving was right around the corner this visit would be quite timely. The kids would see where Thanksgiving dinner comes from. So on a cold but sunny November day we all put on our winter coats and mittens and piled onto the school bus, which took us straight to the farm. When we got out of the bus we immediately heard gobbling coming from a fenced in area, which sounded very festive and wonderful to our little ears. So much so that we didn't notice the smell of turkey droppings or pay attention (at first) to the turkey dander floating through the air. No, we simply ran up to the fence and beckoned those odd looking birds to come over and be petted, just like at the zoo. The birds seemed gentle and even somewhat tame, as a couple of them allowed us to stroke the feathers on their backs with no complaints or pecking. And every so often a large man in heavy clothing with white cover-alls would come out into the yard and grab one of the turkeys and take them inside. Once when the door behind the man didn't quite close it appeared as though he was holding the bird by the neck and twirling him around. Not realizing the turkey was having its neck broken before being stripped, I followed the other children into the building through a door outside the fence. Through this door we walked along a wall to our left while seeing some amazing views on our right. First the feathers were stripped from the bird. I seem to have a vague recollection of this being done by hand. But next was the part I will never forget. The tool looked kind of like an old fashioned ice cream scooper with a double handle, like pruning sheers, but with a guillotine at the end. Sort of like a much larger version of nail clippers used on cats and dogs, except the large metal loop was put over the head, and when the handle was squeezed the head would pop off, rather suddenly, and surprisingly bloodless. But it was so shocking to me that I had to watch it a second time just to know I wasn't dreaming. Of course there were several "eeewwws," "oh Gods," and "yyuuuucks" coming from the other children, and most likely me, too, as we passed through. Then the bodies were hung upside down on hooks to allow the blood to drain out. I don't recall seeing the birds gutted. I may have blocked that out from my memory. After the second door leading out was breached very little was said by anyone as we were ushered back onto the bus. No doubt our teacher was rather surprised that we were allowed to see the "whole tour." When we returned to school there was a brief discussion about what was "witnessed" so that we little ones could make sense of the process. It was just all part of life's rich, bloody pageant. When I returned home I related the details, as I remembered them, to my Mother who stood there with her jaw dropping. In fact, her voice became so tense and angry each time she interrupted my story that I began to wonder if I had done something seriously wrong. I found out years later that several of the mothers were very outraged about the graphic nature of the tour for such young children. But in 2nd grade (at a different school) I returned to the same farm on a different field trip that did not include the abattoir. By now you may have heard the flap over eHarmony's settlement in New Jersey with a disgruntled homosexual named Eric McKinley, who sued Neil Clark Warren, a Focus On The Family author, and his couples matching business. In spite of the fact that Warren's business broke no laws nor refused to do business with McKinley (eHarmony wasn't set up to match homosexual couples due to Warren's lack of knowledge about such relationships) eHarmony caved and settled the suit. The lawyer for the defense attributed the settlement to the fear of unpredictability of such lawsuits. Other reasons are most assuredly related to the anti-Prop-8 mob mentality spreading like wildfire in California and elsewhere. Michelle Malkin has many of the details and links to the rest. That rumbling sound you hear are the flood gates preparing to burst forth and cause all manner of mayhem. First of all eHarmony is now the subject of a brand new class-action lawsuit certified by a California Superior Court judge, claiming that eHarmony discriminates against gays and lesbians in California, even though the new settlement between eHarmony and McKinley forces the couples matching company to create a new separate website devoted to matching gays and lesbians. Apparently many militant gays will not be happy unless eHarmony goes out of business, or the gay-alternative-lifestyle-agenda gets imposed on every man, woman, and child in this country regardless of their sensibilities. And if they are not in the oppressed minority, then who cares, right? Don't expect militant heterosexual groups to successfully sue gay and lesbian matching sites for not catering to the needs of "straight" people. I also wouldn't hold my breath waiting for gays and lesbians to sue Muslim matching sites, either. These lawsuits are not about the lack of opportunities for gays and lesbians to hook up as there are several sites on the web catered to them alone. And what of this atheist dating site? Are they not denying me my freedom of religion? The lawsuits are totally about forcing Christians to knuckle under to the pressure put forth by the gay and lesbian agenda to "water down" our faith until it is acceptable to them. It is an attack on Christianity that will never stop until The Holy Bible, itself, is either banned outright or rewritten to a degree that is palatable to their sensibilities. It would be a book that is not only tolerant of gays and lesbians, but one that would promote their lifestyle as that good and acceptable and perfect will of God. And that is unacceptable to us. Now I am not writing this to bash gays and lesbians, nor do I even wish to deny them the opportunity to live in sin...if that is what they wish to do. God gives all of us free will, and gives us a choice to follow Him and obey His commandments or choose the other side. The choice is one that each of us must make freely without the sword, government edict, or judicial fiat. And those of us who choose Christ must not be coerced into sinning, either. And this is what they attempt to force upon Neil Clark Warren. Frankly, at this point it might be better for all if he closed up shop and pursued other endeavors, IMHO. What say you? Conscience clause, hello and goodbye. A last-minute Bush administration plan to grant sweeping new protections to health care providers who oppose abortion and other procedures on religious or moral grounds has provoked a torrent of objections, including a strenuous protest from the government agency that enforces job-discrimination laws. The proposed rule would prohibit recipients of federal money from discriminating against doctors, nurses and other health care workers who refuse to perform or to assist in the performance of abortions or sterilization procedures because of their "religious beliefs or moral convictions." The policy invoked objections from the Equal Employment Opportunity Commission's two, yes, Democrats, who in an Orwellian turn of phrase "said the proposal would overturn 40 years of civil rights law prohibiting job discrimination based on religion." President-Elect Abort Orama can't wait to overturn the ruling. Obama has said the proposal will raise new hurdles to women seeking reproductive health services, like abortion and some contraceptives. Right to choose is a one-way street for health care workers and religious hospitals opposed to bloodying their hands with the grisly business of killing babies, who are in for a short reprieve until the Obamessiah of Unity takes office. 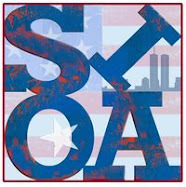 Calls for a response to Probama groups were deferred, as the spokesmen for Prolifers for Obama, Roman Catholics for Obama, and Catholics United still in bed with Planned Parenthood and the DNC since the election were sleeping in and did not wish to be disturbed with trifling inconveniences. Surprise! Surprise!...Obama Voters Are Ill-Informed. 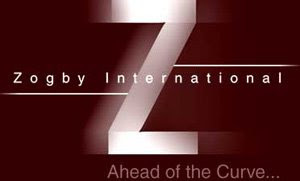 Rather than do this before the election by asking people who INTEND to vote Obama some questions about their candidate, Zogby International waited until after it was too late to matter. Kinda of like saying, "better luck next time." ["After I interviewed Obama voters on Election Day for my documentary, I had a pretty low opinion of what most of them had picked up from the media coverage of the campaign, but this poll really proves beyond any doubt the stunning level of malpractice on the part of the media in not educating the Obama portion of the voting populace," said Ziegler. The part that surprised me most about the results was that only 57% didn't realize that Democrats controlled both houses of Congress. I assumed that figure was much higher, considering the record setting, all-time-low approval ratings.. But it should be clear to all now that the media did, in fact, flex their muscle and show their power as King Makers, or in this case, despots. On November 16, 2008, Father Brankin delivered this homily to his parishioners at St. Odilo Church, the National Shrine of the Poor Souls, in Berwyn, IL. It is an homily well worth posting for all to read. Click HERE for the entire bulletin. Today is the Feast of the Dedication of a beautiful old Roman Church, St. John Lateran—one that sits in the middle of one of the most amazing cities in the world. Part of the universal fascination with Rome is that it is old—so much so that even by the time of Christ it was considered an Ancient city. And here we are two thousand years later still talking about Rome, wishing we could see it or regretting that we never got there—what an incredible place. Did you know that it is against the law in the city of Rome to dig in your basement or backyard—at least any deeper than for a tomato plant? The reason is that the present city of Rome is built on the foundations and remains of the ancient city; and if you were to dig too deeply—which is not deep at all— you might come upon all kinds of ancient Roman artifacts and relics. Understandably enough, modern day Romans do not want their patrimony disturbed and destroyed. There is a big old palace there, the Casa Santa Maria, which was built five hundred years ago as a large convent for sisters. Eventually it became a residence for American priests. But when you go to the basement—say to do your laundry, you can see along the walls of the basement, a series of windows with iron grates opening up into a lower basement. Peer into those openings and you see into large rooms half-filled with earth and rubble; It is then that you realize that you are looking at a whole lower level of building beneath, complete with walls and windows and floors. You are looking at the basement of the original Roman building from two thousand years before! They told us it may have actually been a fire-house for that district of Rome. You get new respect for those old Romans. Well, today is the Feast of the dedication of St. John Lateran Church. The land and original buildings had been given to the pope by the wife of the Emperor Constantine in the three hundreds. It was her family’s palace and quite a gift it was. It has been rebuilt a couple of times since. But St John Lateran is more than just a church—it is the cathedral of the Pope. If the Pope is a pastor—St. John’s is his parish—not St. Peter’s. And when the Pope teaches as the Shepherd of Souls—as the Fisher of men, as the successor of St. Peter—it is from the Chair—at St. John Lateran. That’s how important that church is. Now, thinking about the relationship between a church building and its meaning we need to remember that all the bricks and stones—all the marble and glass—and the gold and bronze, the pillars and porticos are more than just decoration and symbolism. Every element of every church, including St. Odilo, contains in some mystical way the souls of all those who built that church and who worship there, and who maintain it. And above all the church building contains Our Lord—as His House. In fact its very appearance on the street shows forth His presence in the world. And when the Pope utters teachings and declarations from St. John Lateran Church—he is doing so with the Authority of Almighty God. If the Catholic Church is the Body of Christ, then a Catholic church building –like St John Lateran – is the visible expression of Christ. Therefore when the Pope proclaims something that we as Catholics must believe or do to be saved—he does so in the person of Christ who is the first pastor, the Eternal Pastor. That is why it is so important to celebrate feasts like these—feasts about churches—because they remind us so powerfully and beautifully and concretely that when we see a church—it is a sign of the Church-- the very Body of Christ, teaching whatever must be taught to the world. But sometimes things aren’t beautiful—sometimes they are ugly. And even though our recent election indicates that so many more Americans now accept these ugly things as part of our moral landscape—like abortion or contraception or gay marriage or assisted suicide, or war, our Church, which consists of the Pope and the priests and the people must stand as one and stare down these forces of evil and say boldly, “These things are still wrong and deeply so and cannot and will not be swept under the rug”. But there is only one issue and it is not the economy. It is Life. Do we foster it or kill it? And that then leads us to issues about love and family. If we cannot lovingly take care of little babies and their mothers—then we cannot take care of anyone! The next few years may be difficult for Catholics and other Christians who still hold to traditional understandings of family, life and love. Oh no—I don’t think they will arrest us—I don’t think there will be the knock on the door in the middle of the night as they come for those who dare criticize The One. More effectively for their purposes, the mavens of this culture of death will just marginalize us, ignore us, laugh at us, put us on the fringes of society and ask every so often, “Are you people still here? Are you still talking about all that stuff? Well, we will not go away, and we will not be silenced. Remember Rome? It is still there—foundations and all—after 2700 years. And perhaps in another thousand years the Pope may be preaching from another building—but it will probably still be in Rome and on the site of St. John Lateran, and it will certainly still be part of the Body of Christ; and the Pope will still be preaching the same Gospel—that our God wants us to have Life and life to the full—and nothing less will do. Wonderful sermon! I would love to hear that kind of message every Sunday, if only I lived near Berwyn or in Ilinois. But I wonder if Father Brankin has too much faith in the reasonableness of Obama followers. After hearing about the possible Citizen Homeland Security Forces, I have to wonder if they will simply ignore us, like Father Brankin suggests, or throw us in jail for the audacity of intolerance ---> standing up for morality. I had heard of Safe Haven laws, but assumed they only applied to illegal aliens ducking the long arm of the law. Now I see there are Safe Haven laws in several states, which were written with the best of intentions, to protect unwanted newborn babies from being dumped just anywhere and left to die. Instead, designated hospitals have been certified safe havens where children, in some cases up to 17 years, can be legally abandoned. There are to be no questions asked and no repercussions for the abandonment, unless physical abuse is apparent. The reality of the situation in Nebraska, the last state to adopt such a law, is that children between the ages of 10-17 make up the bulk of the abandonments for reasons not limited to incurable disease, mental retardation, or unruly misbehavior. And it's all done with impunity. How surprising that only three dozen children have been abandoned...so far. The Nebraska legislature met Friday to repair the law---one bill limits the age for dumping at safe haven hospitals at three days old while the other bill sets the age cut off at 15 years. The final bill could be ready for the governor to sign as early as November 21st. The law would go into effect immediately, but until then some are even crossing state lines into Nebraska to take advantage of the old law before the changes take effect. A sharp increase in abandonments is expected before passage of the bill into law. Some sort of safe haven law for unwanted newborns is probably a good idea,...sometimes. 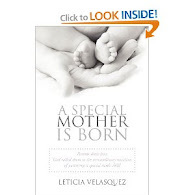 You don't want to read about newborn babies abandoned in dumpsters, certainly. But then you also don't want to have laws that encourage reneging responsibility of parenting by making abandonment so temptingly easy, either. The fact that parents are dumping their teenagers would suggest that for one reason, or perhaps several reasons, parents are giving up on raising them merely out of frustration. And the frustration is no secret to anyone who has recently spent any amount of time with parents of teenagers. Parents are simply not allowed to discipline their children anymore. The government has gradually encroached upon how our children are raised for several years. First they made it a crime for teachers to spank children, and then later it was outlawed for parents to do the same. In most states a parent who takes a screaming child out of Walmart into the parking lot to apply a little corporal punishment can be and have been hauled into court for child abuse. As a result, most parents of children under 10 or so take the kids home and apply such attitude-adjustment methods behind closed doors. But when the children get older they learn that they have the power to misbehave without consequences, and that the government will protect them from receiving anything worse than a grounding without car privileges. As a result, teenagers run wild and get involved with gangs, drugs, and in the case of girls, prostitution. Any legal consequences ($$$$) the children find themselves facing for such behavior is then leveled at the parents, who sometimes wind up facing civil lawsuits or even criminal charges. Sometimes I wonder why tens of thousands of parents aren't dumping their kids at safe havens. Of course the best way to avoid many of those problems is to attend church regularly and take (or drag if necessary) your kids with you. Although not every church-going family is immune from strife, keeping God in the works goes a long way toward harmony and stability during those nasty, awful teenage years. A family that prays together, stays together... as it has been said many times. Saints Alive! 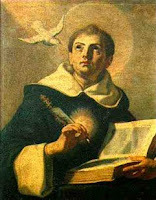 Did St. Thomas Aquinas's Intercession Convert Serbia's 'Champion of Abortion'? The Spanish daily “La Razon” has published an article on the pro-life conversion of a former “champion of abortion.” Stojan Adasevic, who performed 48,000 abortions, sometimes up to 35 per day, is now the most important pro-life leader in Serbia, after 26 years as the most renowned abortion doctor in the country. Catholic News Agency has the full story and video here. No one is beyond hope. Pray for Obama's conversion. Obama promised Planned Parenthood that as President, the first thing he'd do is sign the Freedom of Choice Act, but can he be stopped now that he's elected? Imagine if you were back in the time of the Holocaust, and you added your signature to over 100,000 (maybe even a million) to a petition to free the Jews, and that petition were presented to Adolf Hitler. How do you think he'd respond? Petitioning for some help from above would be more effective. How about joining millions of Catholics in making a pledge to pray rosaries for the intention of strengthening the Culture of Life? Pledge them here, and pray 'em. US Conference Of Bishops Cease Funding ACORN...Finally! [BALTIMORE - The US Conference of Catholic Bishops is permanently cutting off all funding for ACORN in the wake of an embezzlement scandal and allegations of voter registration fraud and political partisanship. The national nonprofit, with more than 1,200 local affiliates, attempts to organize low-income people to advocate for improvement in their communities. Bishop Roger P. Morin of New Orleans said yesterday that the Catholic Campaign for Human Development, an antipoverty program run by the bishops' conference, decided that it could no longer be certain of ACORN's integrity or accountability. The bishops had been giving $1.1 million a year to 41 ACORN affiliates. "We simply had too many continuing questions and concerns about these serious matters to permit any further funding of ACORN groups," Morin said. Steve Kest, the executive director of ACORN, said last night that he would wait until he hears from the bishops before making any comment. Morin said the bishops are also conducting an audit to determine whether any of the Catholic funds were misused by ACORN. So far, he said, there is no evidence that Catholic funds were embezzled. The Catholic Campaign for Human Development is financed largely through a collection in most dioceses the weekend before Thanksgiving. Morin said the funds will now be disbursed to other groups that use community organizing to combat poverty. The italicised type was my own addition to draw attention to the $1.1 million the Bishops have been donating to elect Democrats hell-bent on providing abortion-on-demand for any and all females in "trouble." Actually I am sure the Bishops didn't have abortion in mind at all when making such an annual donation. It must have had more to do with empowering people living in economically poor conditions. Or so they assumed. The Bishops are shutting the barn door after the horses ran out and stole an election. But I suppose it's better late than never. I just hope they do more research on whom they donate to in the future, rather than throw money at what looks good on the surface. Read Bishop Roger Morin's full report HERE for more in depth information. We've heard it before under Clinton, who promised to make abortion "safe, legal, and rare". Back then, Democrat Catholics (which is to say those voters whose allegiance to the Democratic Party takes precedence over their loyalty to the Catholic Church) latched onto the last word. ("See, he said rare!") During the election, nominally pro-life Obamabots parroted the campaign propaganda point that Obama is pro-life since his policies would motivate people to have fewer abortions, at the same time he erases all legal restrictions on doing so. But as things already stand, any mother in need can now get all the aid she wants to raise a kid, and McCain wasn't going to eliminate it. The sad truth behind these Catholics and others who claim the pro-life label for themselves is that they're insincere. They must be since they latch onto Obama's empty promises of lessening the abortion rate while simultaneously removing every extant vestige of legal protection for the unborn. If they cared a whit about protecting the unborn, they wouldn't settle for empty rhetoric and opposite actions. It would seem that this self-defeating stance is relegated to the pro-life cause and no other. No sincere pro-gun advocacy group is touting Obama as the pro-gun candidate since, though he would ban many types of guns now commonly owned and in use, he is going to send out checks to every American after tax time which, if you want, can be used to buy a new gun before the ban goes into effect. Gun-totin' yokels are neither as apathetic nor as easily duped about the Second Amendment as the American Catholic left are about abortion. 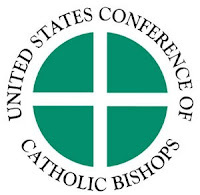 The US Conference of Catholic Bishops must share the blame for the looming threat of the FOCA (Freedom Of Choice Act) to close hospitals. The members of the conference are of two minds. 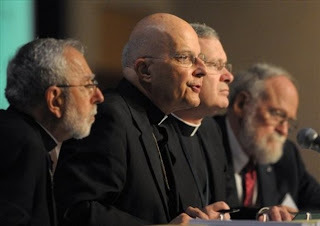 Conference president Cardinal Francis George is exemplary of the first, that which opposed electing a pro-abortion President from the outset (see interview below), while vice president Bishop Gerald Kicanas is of the second, to be complicit in Obama's being elected President (see interview below the first). The sharp division in the conference led to the issuance of a directive before the election to voting Catholics that was so weak and vague as to be non-committal. Q: Therefore, while you would presumably support better health care and anti-poverty measures, in your mind that’s not an alternative to efforts to outlaw abortion? it’s not a slam-dunk which way that vote should go. Is that right? A: Yes, and I think that’s what “Faithful Citizenship” is saying. As a disciple, as a citizen, you have to weigh issues, you have to consider the character of candidates, what you think they will be able to do in terms of affecting the society and the culture in which we live. Clearly, the document is saying that to vote for someone who is proposing actions that are intrinsically evil, because of their position on those intrinsically evil acts, is certainly problematic for someone who is a believer in Christ. You don’t believe in Christ and then vote for a person simply, or primarily, because they hold a position that’s contrary to the church. You have to take those positions into consideration, and then make a choice. These are never easy choices. Sez him. The choice is clear and easy for every voter who cares about ending the intrinsic evil of abortion. Along with their theological opposition to the procedure, church leaders say they worry that any expansion in abortion rights could require Catholic hospitals to perform abortions or lose federal funding. Auxiliary Bishop Thomas Paprocki of Chicago said the hospitals would close rather than comply. Now that the time to put the weight and muscle of the Catholic vote behind defeating Abort-O-rama in the election is lost, the weapons available to the American bishops are issuing statements, pleas, requests, and recommendations, but the real power now resides with Barack Obama and both houses of Congress heavily in control of the Democrats. The bishops conference passed at the first call, and they've raised this round by betting the pot: our hospitals, irreplacable, built with centuries of work and sacrifice. We'll see whether they win, lose, or bluff. But they should not have waited this late to begin to push back. 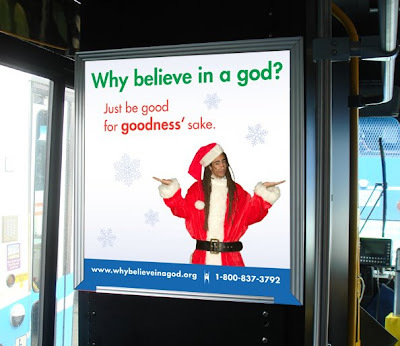 A humanist group, who does not revel in the Christmas spirit due to their inability to relate to Christianity or any God in general, has chosen this Christmas to post ads on buses in Washington D. C. with the following slogan: Why believe in a god? Just be good for goodness' sake. The American Humanist Association spent $40,000 on this holiday ad campaign to reach out to those "agnostics, atheists, and other types of nontheists" who feel isolated and alone during the Christmas season. The organization's website is posted on the ad so that the God-haters can congregate together online and discuss their revulsion toward the rest of us having a great time. This is not how other non-christian groups act. I became aware while living in Chicago that many Jewish people felt left out at Christmas, but the Jewish people didn't try to rain on our parade with provocative ads. They simply came up with the annual Oy Vey party and the Matzo Ball, a Jewish singles party held on Christmas. Fair enough. So instead of trashing Christmas and attacking Christian faith, why can't these party-poop humanists create their own celebration? Perhaps their beliefs, or lack thereof, constantly remind them of their ever-looming mortality which dampens their spirits. After all, how festive can one feel when one believes he is on this earth for no reason or purpose, and that he is some sort of accidental combination of cells that will die off and rot someday? Some people are not happy unless they share their misery with others. Happy Veterans Day... And Happy Birthday, Marines! Just wanted to say THANK YOU to the vets who have served our country throughout the ages. And also a slightly belated HAPPY BIRTHDAY to the US Marine Corps. F.Y.I., Applebee's is giving free dinners to vets TODAY ONLY during business hours at select locations. Click HERE for more information, first!. In other words, take your vet out to dinner today/tonight to say thank you for serving our country. You probably remember how Congressional Democrats and their amplification network in the MSM had a cow when President Bush proposed an exciting proposal to shift workers' Social Security contributions to private investment. The worker would benefit from growth on his investment by retirement, and the government would have a lessened obligation to support him. At that, the worker's private investment would have been only a portion of his Social Security taxes, and only if he opted to participate. Yet, the Dems went ballistic at the very idea of privatizing any Social Security monies whatsoever. The Bush proposal died a quiet death, and your FICA payments are under federal control. With the Democrat takeover of Congress and the White House coming in January, hearings now taking place in the House already point to the sad fact that they can't wait to sink their meathooks into your private retirement savings, because now that the American electorate stripped themselves of effective Republican checks and balances, the FICA taxes you and your employer pay aren't enough to feed the Democrat beast. Discussions are underway regarding the money you've earned, sacrificed to set aside for your future, made your own cost-benefit decisions as to where to invest it - and take it all away from you to put in an account run by the Social Security Administration. What's your stock fund making you annually over a 10 year average? Probably in the ballpark of the average return on the stock market from 1926 to 2005, which was 10.4%. Your confiscated retirement funds would be removed from the private sector and deposited in government accounts, for which they would pay you a piddling 3% interest. If you have loved ones who are depending on your retirement funds as their inheritance, don't drop dead. The government is raking off half of it. In the leadup to the last election, the Democrats scored higher than the Republicans on the economy why? From Freeman Hunt, who got it from Instapundit, who got it from The Onion. Pardon the ads. [As improbable and statistically dubious chunks of votes appear and disappear, overwhelmingly benefiting Al Franken, the Coleman for Senate campaign today filed a data practices request with county auditors and the Secretary of State requesting data related to Election Night results, records related to ballot security and information relating to all revisions made to the results since being reported on Election Night. "Minnesota has a history of fair and clean elections, and we are committed to ensuring that this election is no different. That is why it is so troubling to us that instead of the normal slight changes in vote totals one would expect during this process, we are now seeing huge chunks of votes appearing and disappearing - statistically dubious and improbable shifts that are overwhelmingly accruing to the benefit of Al Franken. And, as many of these unexplained and improbably vote swings are taking place on the Iron Range, we're asking that local and state election officials provide us with the necessary data to reassure the public that the canvassing process has not been tainted," said Cullen Sheehan, campaign manager. The Democrats have their majority. They are so comfortable with that majority that Senate Majority Leader Harry Reid is risking the loss of Senator Joe Lieberman to the Republican Party by removing Lieberman from his chairmanship of the Homeland Security Committee, simply for backing his long time friend, Senator John McCain, in his presidential bid. So with all this comfort, why cheat? Why steal yet another election? Is it hubris? It has been expected that the Dems would engage in overreaching sometime before the next election. Has it already started before this one ended? 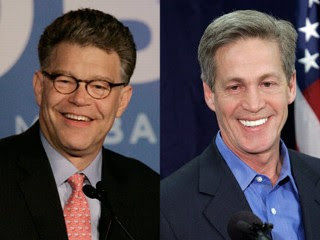 We will keep an eye on Mark Ritchie and Al Franken, and hope you do, too. 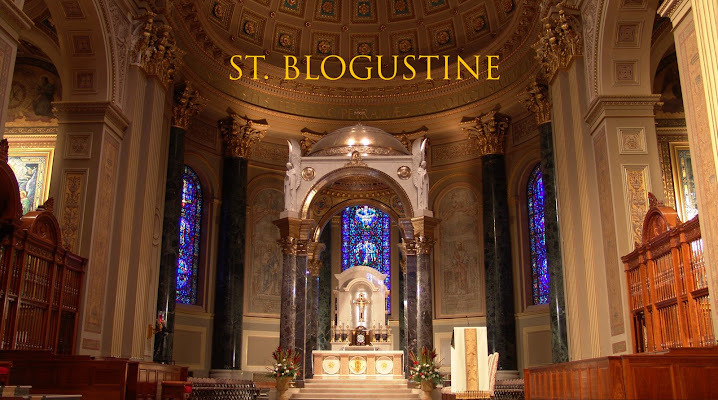 We here at St. Blogustine believe in congratulating politicians for an honest (or reasonably honest), hard fought, campaign whether or not we agree with them politically. We also consider ourselves "good sports," good Christians, and truthful bloggers. Hypocrisy is not something Kevin or I indulge in to advance our cause. That is why we are offering absolutely NO congratulations to the Obama campaign for their "clear victory" over McCain-Palin. It may sound like sour grapes to some. But when someone cheats in cards or steals money from the bank in Monopoly, we do not shake hands and say "good game." That, in our view, would be hypocritical at best and/or horribly naive. It would also cheapen the many posts we made about Obama's illegal fundraising, ACORN's illegal multiple voter registrations, the major TV network's supreme lack of objectivity, and general pro-Obama thuggery at polling stations and elsewhere. These were not exaggerations made in order to get our guy in power. They were documented, legitimate reports meant to both warn and enlighten voters about the choices before them. Although some questionable behavior during a campaign is to be expected by either side when there is so much at stake, this election saw the Press, Obama, and Obama supporters go beyond the pale and literally sell their souls in order to get their candidate into power. We will not even offer cleverly worded, backhanded (*snicker*) congratulations for that. Instead, we will continue to tell it like it is, as always, until someone shuts us down. I just voted while my two preschoolers were fawned on and given slices of poundcake by the pollworkers. My four year old son gazed all around the place hoping to spot McCain and Obama somewhere in the room, greeting all the voters. Here in Obama's home state of Illinois, the political winds are blowing in such a way that voting for McCain has about all the effect of voting against Castro. From my small sample of mass going Catholics I've spoken with, I think if McCain wins it'll be by the grace of God that resides in the Protestants. Or maybe that's just the Chicago regional Robocratic hue that stains the Catholics of the Chicago Archdiocese. In the conversation I had last night with our friend, a mass going Catholic mother of four whose husband is trying to nose into Obama's victory bash in Grant Park without a pass, I brought up the subject of Obama's stance on the Born Alive Infant Protection Act and the promise to sign the Freedom of Choice Act. 1.1 million babies are aborted each year here, and this election is a pivotal moment to change that. She replied, "I'm not a one-issue voter," which translates to "I don't give a crap about the 1.1 million babies." God help us. If He is, I haven't been shown it in my parish. When I went to pick up my kids at the parish school this afternoon, an announcement came over the PA with the final count in the mock election, which no doubt correlates with how the children's parents will have voted. The score: McCain 55, Obama 149. A loud cheer erupted throughout the school. Catholic kids in their uniforms scurried and whooped about the parking lot, cheering and giving each other high fives. I seethed. My two fine sons, raised right, voted for McCain. They know enough about abortion to be against it. The oldest felt sensitive about the defeat on the ride home. The "Catholic" vote in my home parish is an abrogation of moral responsibility, an abuse of citizenship. God save our country! Sadly, I cannot take credit for either of these. I found the Obama one last month, but forgot who originally published it. The other is from Dr. Slogan. It's NOT About Race, Stupid! An outstanding You Tube video in which several reasons for voting NObama are listed, one by one. What the Main Stream Media doesn't wish to highlight,...we will. I wonder if McCain knew this was coming. It would certainly explain why he and Sarah Palin have been hitting my state of PA so hard. This is quite a November surprise sprung on Obama and in his own words, too (read more about it HERE). But if the San Francisco Chronicle had done its job and reported this stunning admission by Obama when he made it in JANUARY, it would be no surprise today. But the Chronicle covered up the story! Click HERE for the story that omitted the admission. Yet another corrupted news outlet. This is the You Tube video everyone is talking about. Pay close attention to the ending. I couldn't agree more with this war hero that freedom is a concept which Obama doesn't seem to quite grasp. To us, freedom means making our own decisions about our lives and then taking responsibility for the consequences; then utilizing our freedom to make more choices and changing said consequences, if necessary. 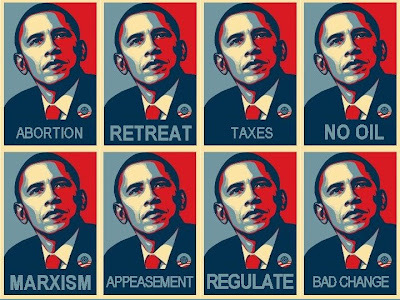 But to Obama, freedom is not the means to an end, but rather the end itself, requiring some form of government imposed intervention to achieve it. In other words, to Obama one must be successful in order to be free rather than free in order to be successful. But the government intervention doesn't go away once success is achieved. For in Obama's world, the successful must be heavily burdened with the responsibility of those who are unsuccessful. This is the whole idea behind his plan to "spread the wealth around." To Obama, freedom is success engineered by authorities who give very little flexibility in the outcome. And it stands to reason that if everyone is "successful" to the same degree then the high end of success is reduced, along with our incentives to achieve. One merely has to look at history. From each according to his ability to each according to his need. Although Obama's intentions may not be quite so rigid, that Marxist quote seems to be the foundation upon which his fundamental views rest. And history has proven that this does NOT work in the long term. My own view and the view of most Americans is that while I am working to acquire riches and/or success in life, I do not expect to be bailed out by my government when I'm wrong anymore than I wish to have my pocket picked when I'm right. And this is only part of why the war vet in the video above was willing to risk his life (and lose his leg).